Well here we are. Second child on the way, and second time we have reached our due date with no sign of birth in sight! We had our 40-week doctor's visit yesterday morning, and the report reminded me exactly of how it was with Daisy. Head nice and far down, creating a lot of pressure, but very minimal dilation and effacing. We were scheduled for a Monday morning ultrasound for the BPP (bio-physical profile) where they check to make sure the baby has enough fluid and is moving around well, etc. Assuming that looks good, and we don't have the baby sometime during the week, we'll have our 41-week appointment next Thursday afternoon. At that point, we'll discuss the plan for the final week, including induction if needed. Our doctors/midwives prefer not to go past 42 weeks (the rate of stillbirth jumps dramatically past that point) and I agree. I really do not want to be induced, so we're willing to go the 42. But after that, we'd rather be safe than sorry. Part of this is because at times, people are unsure of dates of conception so actual due dates can be off. This can make it likely for babies to be "late" but not really be that late. I am 100% positive of our date of conception, therefore I know that our due date was calculated accurately. As I said, I'm willing to go the 42 weeks that most practitioners agree is safe, but to me it is not worth the risk after that just to avoid induction. I am trying to have confidence that God knows our situation and desires and that he will provide. Many of you remember that Daisy was late, and in our 9th day past due date, my water finally broke and the labor process began. So I know that just because I'm late now doesn't mean that the worst case scenario will happen... but I'd appreciate your prayers anyway that I (we) will be patient in waiting for the big day to arrive. In other news, we did our usual Our Daily Bread breakfast after our appointment yesterday. We then went to a local showroom to see some landscaping stones for possible use in our driveway project. Also, this morning I took Daisy to the local library to read books and attend storytime. It was nice to get her out of the house and for all of us to keep ourselves busy as we play the waiting game! Hopefully more news to come soon. 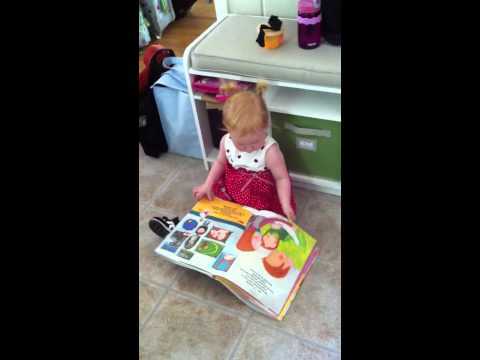 To close, I'll post one video of Daisy reading to herself when we got home from the library today. how did the bpp go?? ?